If you've thought you might want to start investing, but don't know where to begin, you're not alone. A recent survey from NerdWallet found that more than 80 percent of Americans weren't able to identify the proper type of account to open to trade stocks. It's no wonder: This stuff isn't taught in most schools. That's why all this week, we're running a series on basic investing lessons to help people get started. The goal is to give investing novices the information they need to get their money working harder for them. The articles in this series will cover the various types of investments that are available, some strategies on investing prudently, tips on opening the accounts you'll need to get started, and how to research promising investment opportunities. The final lesson will include some general advice on how to keep your cool and become a successful investor over the long run. First, though, let's take a look at two fundamental questions facing anyone who wants to start investing: How can you find money to invest, and how much should you set aside? Believing you don't have enough money to invest is one of the biggest barriers to getting started. The NerdWallet survey found that almost 40 percent of those who said they weren't investing believed that they lacked the money to get started. That compares to just 14 percent who said that they didn't understand the mechanics of how to invest. What many people don't realize, though, is that it has never been easier to get started, even with a very small amount of money. For instance, if your employer offers a 401(k), you can earmark a percentage of your paycheck to be invested in a retirement savings plan. For someone earning $50,000 a year, a 1 percent payroll deduction into that 401(k) will cost you less than $10 from each weekly paycheck. Nor are employer-sponsored 401(k)s the only way to get rolling with limited cash: Financial companies want your business, and many of them are willing to take on even small accounts, based on the expectation that your relationship with them will grow over time. For instance, many mutual fund companies, which pool your money together with funds from thousands of other investors to buy large portfolios of investments, offer access to their funds with investments of as little as $100 if you agree to enroll in their automatic investment programs. Under those programs, you'll have money automatically transferred from your checking or savings account to make additional investments in the fund, with transfers typically made once a month or once every three months. The first step to establishing an investing budget is making sure you've already taken care of higher-priority items. For example, if you have high-interest-rate debt, such as a credit card balance, it usually makes more sense to get it paid down first. Unless you're incredibly lucky, no investment you pick will be able to earn you the 15 percent to 25 percent a year or more that you'll pay in finance charges on a credit card balance. Also, if your employer offers a 401(k) matching contribution, make sure you're contributing enough to get every matching dollar you can: That's essentially free money your employer is offering you as an encouragement to save for retirement -- so take it. Beyond those, figuring out how much to save depends on your situation. Saving 10 percent of your net pay is a good long-term target to increase your odds of maintaining financial security throughout your lifetime, but you don't have to get there right away. 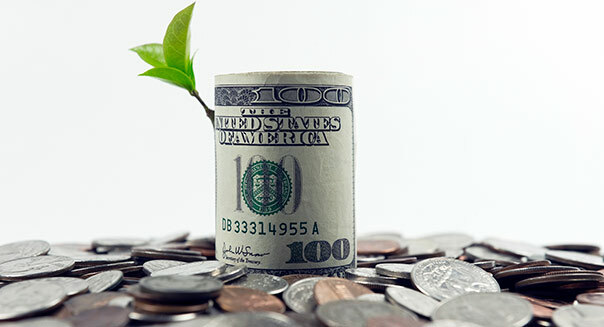 One thing many beginning investors do is to start with more modest savings goals, but then, as they get annual raises or better-paying jobs, they boost their savings by the amount of the raise. So even if you start saving just 1 percent of your pay, you can grow that gradually toward your ultimate 10 percent target. And obviously, cost-cutting can also free up funds in your budget for investing. Whether you seek out discounts on your spending or simply spend less in certain high-cost categories, you might be able to set more aside in your investment account. So don't let fear that you don't have enough money on hand today prevent you from starting to invest. Even small amounts add up over time, but only if you don't talk yourself out of beginning. In our next article, we'll cover different types of investments and how to figure out which ones are right for you.